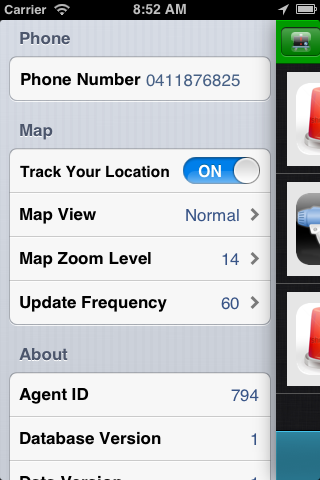 The settings panel can be activated by pressing the button at the top-left of the main interface. The following image annotates the settings button. The image below shows the settings panel. Phone: Allows you to rectify phone number. Map: Allows you to finely control various mapping options. More about this here. About: Gives you read-only general information. The following video demonstrates activating the settings panel and rectifying phone number.